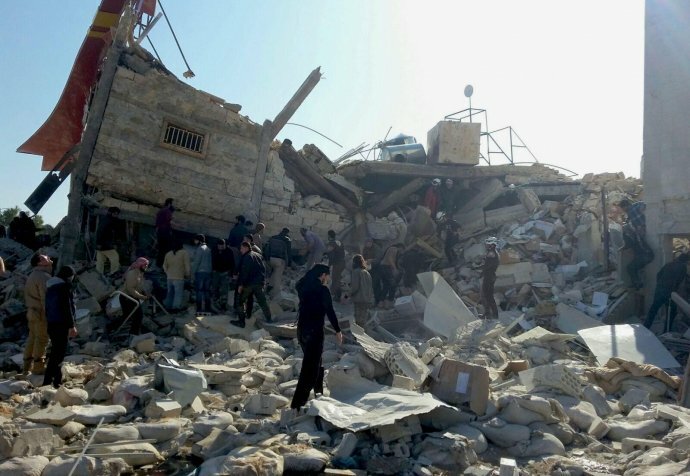 An investigation conducted by research agency Forensic Architecture reveals evidence reinforcing our conviction that Russian and Syrian coalition forces were responsible for bombing the hospital in Ma’arat Al Numan, Syria. On 15 February 2016, Ma’arat Al Numan hospital was hit by rocket fire. 25 people, including one of our staff, were killed and 11 others were wounded. The casualties were taken to another hospital that was targeted later the same day. After the attack, Dr Mego Terzian, president of Médecins Sans Frontières France, publicly accused the Russian-Syrian coalition of being responsible for the bombings — a conviction based on an analysis of the context, the military forces present and testimonies from Syrian civilians who were at the scene. The accusation led to a cascade of reactions from the governments of Russia and Syria, ranging from denials to accusations of spying, as well as much heated debate within our international movement. "While their investigation does not provide conclusive evidence, it reinforces our conviction that Syrian and Russian forces were responsible for the bombing of the hospital in Ma’arat Al Numan"
A year later, research agency Forensic Architecture publish a report that is using cartography, image analysis and legal and architectural expertise, that looks into the airstrike to establish the facts. The Forensic Architecture team have conducted an investigation based on videos and photographs circulating on social media, taken by medical personnel, activists and ordinary citizens that they have authenticated and analysed to reconstruct the bombing. 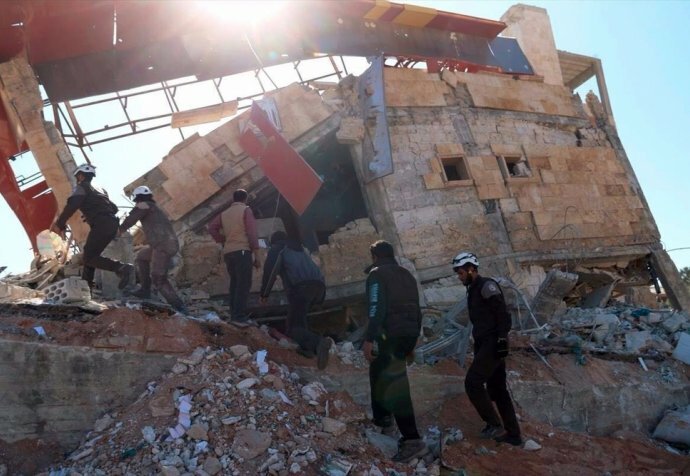 While their investigation does not provide conclusive evidence, it reinforces our conviction that Syrian and Russian forces were responsible for the bombing of the hospital in Ma’arat Al Numan. According to their investigation, Russian and Syrian planes were seen taking off from their respective bases corresponding to the time and location of the strikes. Examination of video footage of one of the planes shows its resemblance to the MiG-23 fighter jet that only the Syrian army is using in the country. Their investigation goes on to confirm the use of double/triple tap attacks, i.e. repeated bombing of the same target at close intervals — a clear illustration of the relentless persecution of civilians and relief organisations in Syria. Close to one hundred medical facilities belonging to or supported by Médecins Sans Frontières have been bombed since 2015. The vast majority were in Syria, with others in Yemen, Afghanistan, Ukraine and Sudan. We consider it vital to establish the facts and ascertain who was responsible for each of the bombings so that we can continue to provide assistance in war zones with credible assurance that civilian facilities will be protected. However, perpetrators continue to deny, contest, minimise their responsibility, or describe their attacks as simple errors. We can do very little to hold perpetrators accountable for bombing our facilities, medical staff and patients. Apart from filing a court complaint in the relevant country, we can ask the International Humanitarian Fact-Finding Commission (IHFFC) for an independent and impartial inquiry. Despite being the only permanent body set up specifically to investigate international humanitarian law violations, the IHFFC requires the consent of those involved to be able to take action. Called on after the US army airstrike on our hospital in Kunduz in Afghanistan, the Commission was unable to launch an inquiry because the US did not give their consent. All too often the only real redress available to us is to publicly denounce perpetrators of bombings in the hope that the damage to their public image will lead them to modify their practices. We again call on all warring parties to stop bombing hospitals, and respect the protected status of medical facilities, patients and medical staff.